It’s now 18 years since we first saw the world’s favourite wizard, Harry Potter, come to life on screen. Harry Potter and the Philosopher’s Stone (or ‘Sorcerer’s Stone’ in the US) was released way back in 2001 and easily became the highest grossing film of that year. In the years following, a further seven beloved films were released. At the insistence of J.K. Rowling, the creator of the entire Harry Potter universe, all of the films were shot in the UK and featured British and Irish actors. This stipulation provided a much-needed boost to the British film industry but, even more excitingly, ensured that Harry Potter fans need go no further than the UK to step inside the wizarding world they love. And so, it’s possible to visit most of the locations used by the movies – here is our guide to the main sites from these wonderful films. One place that’s at the very top of every Harry Potter fan’s travel wish list is Warner Bros. Studios, London. This studio is located 18 miles northwest of central London in Watford and was used as a base for every Harry Potter film. Once shooting wrapped in 2010, Warner Bros. Studios transformed itself into a behind-the-scenes extravaganza where ordinary muggles can be wizards for a day. Visitors can pick up real props, try on costumes, and tour sets where some of the most famous scenes were filmed. Imagine sitting down on the wooden benches of Hogwarts’ Great Hall, browsing the bookshelves in Dumbledore’s office, drinking tea in Hagrid’s Hut, pushing paper inside the Ministry of Magic and peering into the windows of the iconic shops in Diagon Alley. Touring a film set is exciting but sometimes getting that access behind-the-scenes, where camera angles and clever editing perform miracles, can rub a little of the Harry Potter magic away. Then it’s time to find the places where your favourite film overlaps with the world you actually live in. The best place for Harry Potter fans to stand in the shoes of “the boy who lived” is in London, at King’s Cross Station. Here you can see where students boarded the Hogwarts Express in all eight films. While the scenes were actually filmed on platforms 4 and 5, you’ll soon find platform 9 ¾, complete with a disappearing luggage cart. For another nostalgia hit from the first Harry Potter film, visit the Reptile House at London Zoo, the very place that the tiny Harry of the Philosopher’s Stone learns he is a parseltongue – in other words, that he can speak the language of snakes. Another great Harry Potter shooting location in London is Australia House, 5 minutes from Temple tube station. Here, at the home of the Australian High Commission, all scenes of the interior of Gringotts bank were filmed. Finally, a few minutes from Monument tube station, you can see Leadenhall Market, an atmospheric Victorian market that was used in the first Harry Potter film as the exterior of Diagon Alley and the Leaky Cauldron. If seeing the London sights has not sated your desire to delve deep into the world of Harry Potter then pack your bags and head on a tour of the rest of the UK. Less than two hours away from London, you will find Lacock Abbey. The abbey dates back to the reign of Henry II and the nearby village of Lacock is composed of timber framed cottages that are quintessentially English. The cloisters at Lacock Abbey was used in both the Philosopher’s Stone and the Chamber of Secrets as Professor Snape’s potions classroom. You can also add Hardwick Hall in Chesterfield to your Harry Potter itinerary. A famous English country house built by the formidable Bess Hardwick in the 1500s, Hardwick Hall is a stand-in for the creepy Malfoy Mansion in Harry Potter and the Deathly Hallows. Two of the most iconic and beautiful historic buildings used in the filming of the Harry Potter films are Durham Cathedral and Alnwick Castle, both located in the north of England. Durham Cathedral dates back to the year 1093 and features in the Philosopher’s Stone, the Chamber of Secrets and the Prisoner of Azkaban, representing the interior and exterior of Hogwarts. Visitors can take part in a guided tour of the cathedral for a small fee. Alnwick Castle, a 700 year old castle in Northumberland, was also used for exterior shots of Hogwarts in the Philosopher’s Stone and the Chamber of Secrets. Incredibly, Alnwick Castle is still a private residence. It is the largest inhabited castle in the UK and has been owned by the same family since it was built. 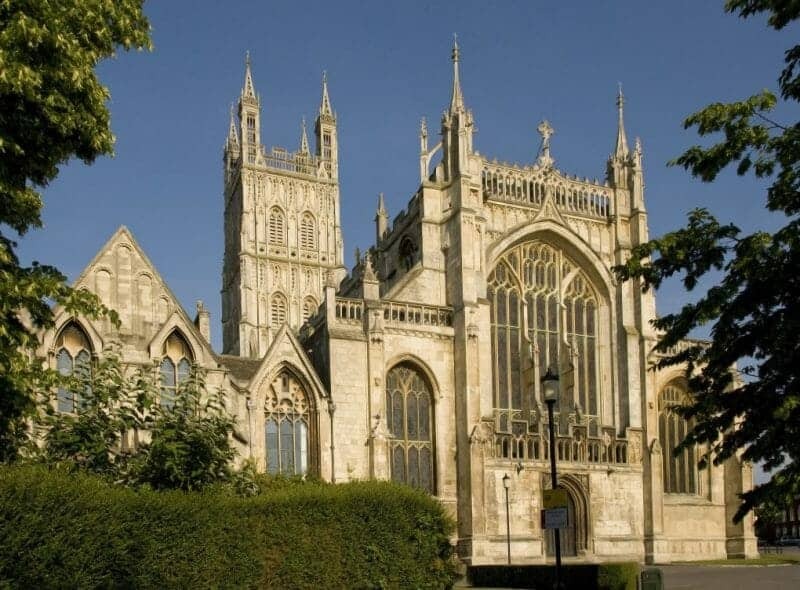 To get the feeling of being inside Hogwarts, head to Gloucester Cathedral. This cathedral’s cloisters, which date back to 1350, were used a number of times as various Hogwarts interiors. If you’ve already been to King’s Cross to see where students board the Hogwarts Express, then you must visit Goathland to see where they disembark. Goathland Train station is located in the North York Moors National Park and doubles up as Hogsmeade Station in the Philosopher’s Stone. Oxford features heavily in all the movies. Perhaps most the most famous location – that was actually recreated in a studio rather than filmed on site – is the Great Hall at ChristChurch College, inspiration for the Hogwarts Dining Hall. Scotland is known for its dramatic landscapes and tranquil lochs and a number of the Harry Potter films feature atmospheric Scottish vistas. Loch Etive, located in the Argyll and Bute area of the Scottish Highlands pops up in Harry Potter and the Deathly Hallows Part 1 as the setting of Harry, Hermione and Ron’s campsite. Glencoe village is located in the Lochaber area of the Scottish Highlands and was used as a number of locations in the Prisoner of Azkaban, the Goblet of Fire, the Order of the Phoenix, and the Deathly Hallows Part 2. Most notably, the village was used as the location of Hagrid’s Hut and is home to the iconic bridge leading into Hogwarts. The bridge is actually a structure known as the Glenfinnan Viaduct and features in the Chamber of Secrets, the Prisoner of Azkaban, and the Goblet of Fire. Another loch, Loch Elit in the West Highlands, was used as the Avalon-inspired island location of Dumbledore’s grave. Last but nowhere near least, the Hogwarts Express itself operated in real life as the Jacobite Steam Train and runs between May and October between Glasgow and Fort William in Scotland. The Harry Potter universe may have reached its conclusion on screen but out in the real world these shooting locations are still standing, waiting for curious muggles to bring them back to life. Quiz: How Well Do You Know England?